Can Taiwanese porridge be a status symbol? Perhaps, if you dine at Jin Shan Lou. 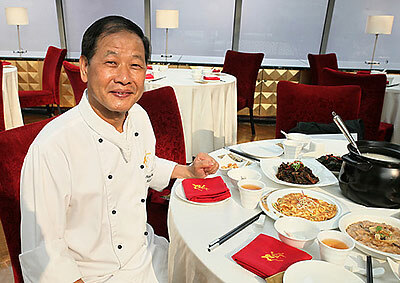 Award-winning Master Chef of Jin Shan Lou, Mr Huang Ching Biao. Marina Bay Sands — or what I like to refer to as Singapore’s temple dedicated to extravagance — is home to Jin Shan Lou, the opulent restaurant located at Tower 2 of the hotel’s lobby. 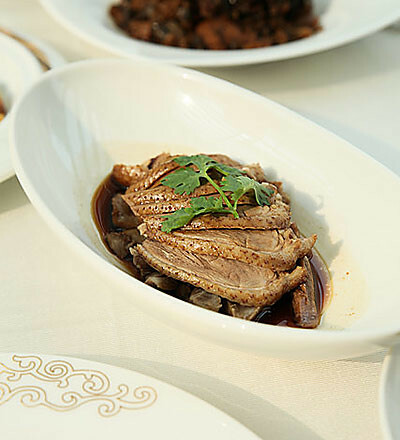 Jin Shan Lou serves Chinese cuisine to its mostly affluent clientele, from bean sprouts to whole sharks fin. 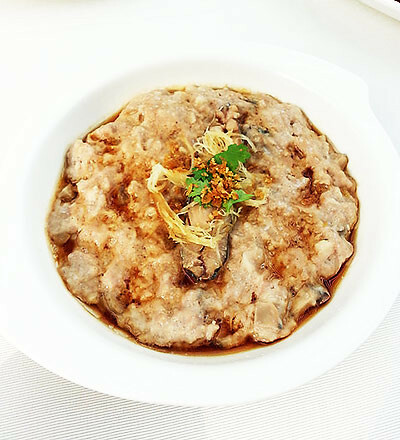 Jin Shan Lou’s award-winning Master Chef, Mr Huang Ching Biao, has added Taiwanese porridge supper to the traditional Sichuan, Hunan and Cantonese offering. With several dozen classic appetizers and speciality dishes on the Taiwanese Supper Menu, patrons can fill their bellies with lavish dishes after a long day. With very few options for Taiwanese porridge after 10.30pm – at least ones that don’t involve sitting on plastic stools, and with servers wearing singlets and red clogs – diners can enjoy the grandiosity of the hotel’s towering glass windows, plush red velvet chairs, and proper china, while slurping down porridge. I have tried many different porridges around the world, and it’s one of those simple dishes where the quality remains high regardless of the price. The main difference is perhaps in the dishes that complement it, such as century eggs with preserved ginger, minced pork with salted fish, etc. Because of the commonness of porridge, it evokes a sense of comfort without pompousness. Jin Shan Lou’s classic Taiwanese supper dishes evoke the same kind of feeling. The comforting white porridge ($5/bowl), made from Thai Hom Mali rice and Australian short grain rice, is punctuated with large chunks of sweet potato. Its texture is light and smooth, and with very subtle rice sweetness. I would have preferred the sweet potato to be sweeter but I guess that’s just the house style. The ‘blandness’ of porridge is the perfect canvas to feature types of food loaded with strong umami taste. And Jin Shan Lou’s palette of steamed minced pork with salted fish ($16), fried Pomfret with fermented bean sauce ($18), stir-fried Chinese cabbage with dried shrimp ($16), stewed pork belly with preserved vegetable ($16), sautéed bean sprouts with salted fish ($18), and deep-fried shrimp paste with chicken ($24.00) makes full use of it. In addition, Jin Shan Lou also offers Taiwanese Fragrant Wine Chicken with Basil & Spices ($20), Chinese Omelette with Pickled Radish ($16) and many others. Catering to the local palate, the menu also includes popular sambal dishes such as stir-fried fresh prawns ($22), stir-fried fresh sotong ($28), or sauteed kang kong ($18). 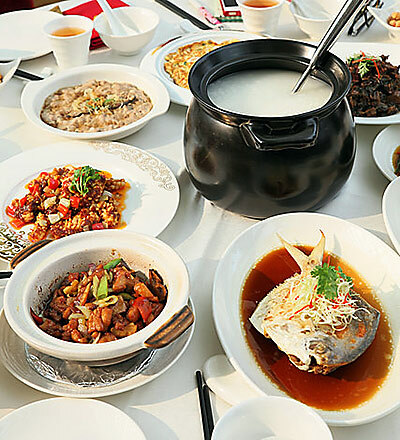 Taste wise, all its dishes are well-balanced, not oily like many conventional porridge stalls, and the flavours are more subtle and refined to be eaten without porridge. However, if you are the type who enjoys balancing the dishes’ saltiness and savouriness with every mouthful of porridge, then you may find the dishes a bit too subtle. Don’t expect to find an average porridge experience at Jin Shan Lou. From the rich ambience of the Marina Bay Sands Hotel to its refined dishes, it exudes sophistication and prestige. And unlike conventional porridge shops, where the ingredients tend to be more “home style”, Jin Shan Lou’s are professionally-prepared and presented. After all, wouldn’t you expect that from a Master Chef with over 40 years of experience? 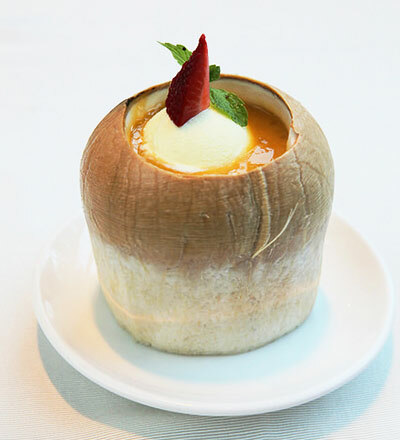 For dessert, I’d recommend the aloe vera with sago topped with ice cream in whole coconut ($16). I don’t know if this is traditional Taiwanese but the taste experience is seductively sublime. A must-try. Don’t expect to find an average porridge experience at Jin Shan Lou. From the rich ambience of Marina Bay Sands Hotel to its refined dishes, it exudes sophistication and prestige. This is a great place to impress your date or guests for supper, even if the craving is for humble porridge. Porridge supper is served from 10/30pm to 2.30am nightly.